Sam Whitaker joined the Great Northern Railway at Bradford, his home town, in 1918. He progressed there from engine cleaner to driver and moved to Grantham in 1947 with his wife Minnie and their son Douglas, who also worked on the railway. Sam (sometimes also known on the railway as Sid, neither being his real name!) retired in 1966. His grandson, Richard, lent us the following newspaper cuttings and photographs about some events during Sam's career on the footplate. First, from a national paper, the story of Sam driving the speed record holding locomotive No. 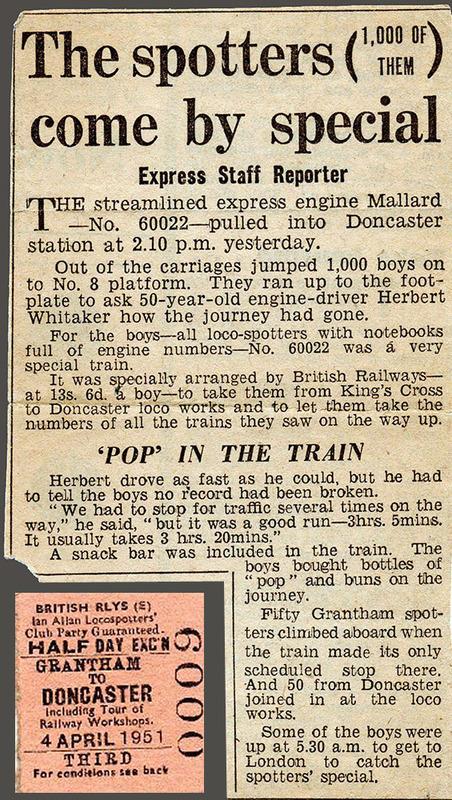 60022 Mallard to Doncaster on Wednesday 4th April 1951 with an Ian Allan Locospotters' Club excursion from King's Cross to Doncaster for a tour of the railway workshops. Cutting from 'The Daily Express', Thursday 5th April 1951. The ticket, used on the excursion by someone who joined the train at Grantham, is from the John Debens Ticket Collection. Class A4 No. 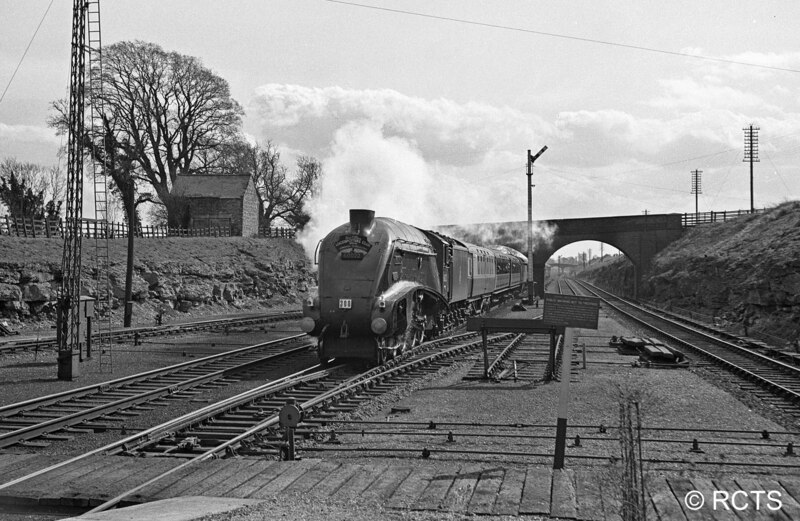 60022 'Mallard' approaching Little Bytham station on 4th April 1951 with the Ian Allan Locospotters' Club special from London King's Cross to Doncaster. Photograph taken by Phillip H. Wells. This image is from the collection of The Railway Correspondence and Travel Society (RCTS) ref. PHW1116 and is used here with permission. 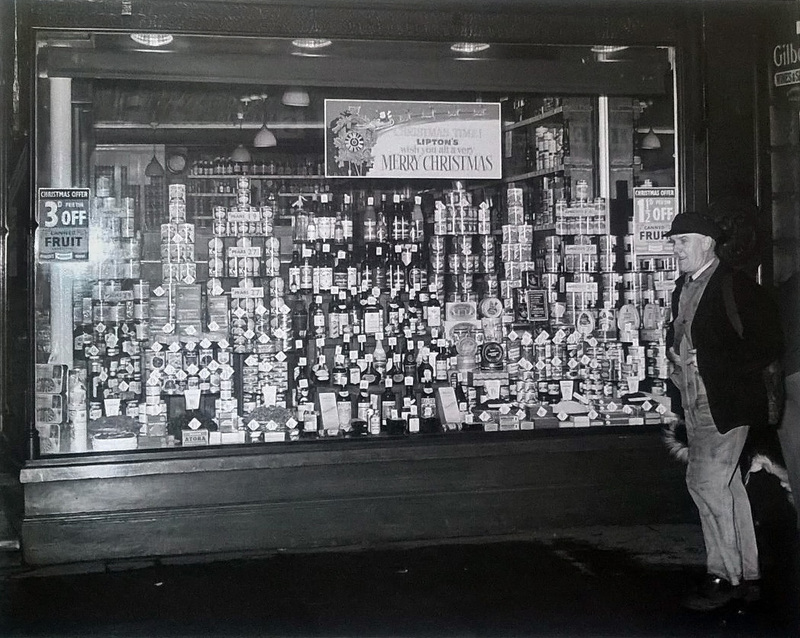 The day before Christmas Eve in 1958 a photographer from the local newspaper approached Sam when he was on his way to work and asked if he could picture him walking past a shop front set out with its seasonal display. Driver Sam Whitaker photographed passing Lipton's grocery shop window on his way to work at the Loco on 23rd December 1958. Note the wartime canvas gas mask bag on his shoulder with his 'snap' inside. The Christmas display offers 3d per large tin off canned fruit. Photograph by The Grantham Journal, ref. 6719/1. In December 1963 British Railways marked Sam's 45 years' service on the railway with the presentation of an engraved wristwatch. 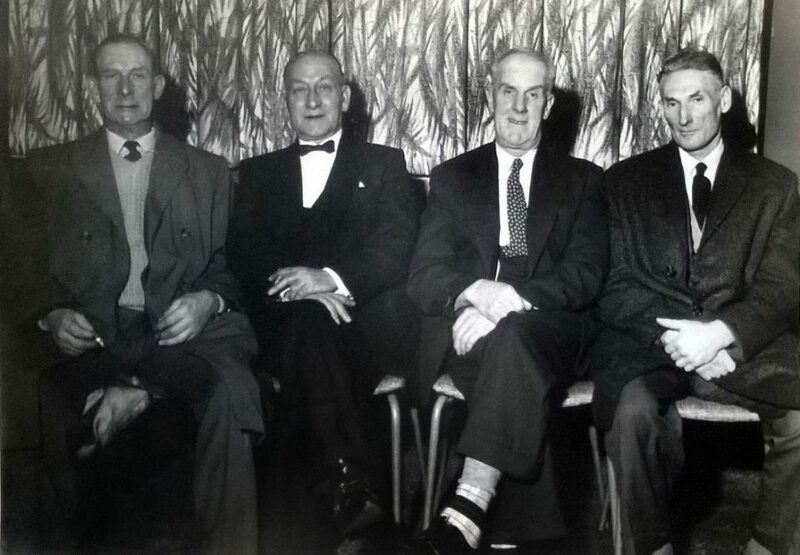 Drivers Austin Brown and Sam Whitaker (2nd and 3rd from left) and two colleagues at an award presentation for achieving 45 years' service on the railway. Sam joined the Great Northern Railway in December 1918, so the picture dates from December 1963 or early in 1964. Can you help by telling us who the other two gentlemen are? There's a photograph of Sam's gold presentation watch below. Photograph lent by Richard Whitaker. 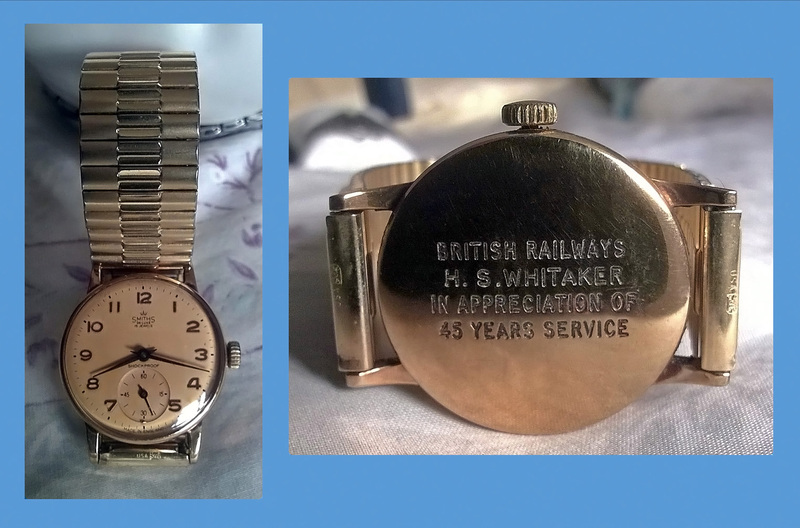 The watch presented to Sam Whitaker to mark his 45 years' railway service in December 1963. On 30th April 1966 Sam Whitaker retired and, as was usual in those days, a reporter from The Grantham Journal called at his home to ask about his career on the railway. He recalled several events, including the return journey of the spotters from Doncaster and how some of them were responsible for damage to a train at Grantham. From 'The Grantham Journal', 6th May 1966. Hi, I'm looking for some information into the career history of my great grandfather who is in the picture above, Austin Brown. Unfortunately I never met him; I was 3 months old when my great grandmother, his wife, passed. I do believe he set our family into engineering and I would like to think he'd be proud to know I've followed in his footsteps. My grandmother often tells me stories of when he would tell her and her siblings to be on a certain bridge at a certain time as he would pass. She often tells us about him driving the A4 class Mallard. Any information would be greatly appreciated. It's always a pleasure to hear from the relatives of people whose photographs appear on Tracks through Grantham. I'm going to reply by personal email.